The Crownline 19 XS outboard is fully equipped with a total package of and amenities. The Nationally Advertised (NAP) starting price of this boat is $35,995 with a Mercury 115 Command Thrust outboard and Sea-Star hydraulic steering! 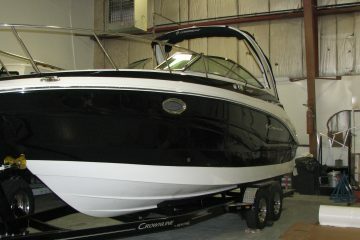 The same expertise and quality materials that go into Crownline’s larger, more expensive boats are incorporated into this boat. Every inch of space has been thoughtfully utilized for maximum comfort and convenience. The soft touch swim platform mat, stainless steel four-step boarding ladder and walk-thru transom make boarding and exiting easy and safe. And there’s a convenient cooler integrated into the portside swim platform so you don’t have to leave the water to get a cool beverage. The U-wrap cockpit seating features beautiful, upgraded vinyl interior and tons of storage is provided beneath the seats. There’s in-floor cockpit storage for skis as well. Keeping refreshments cool on those hot summer days is easy in the large 36 quart cooler that stows away beneath the bench seat. Driver and passenger flip up bucket seats are standard. The custom Moonrock dash has easy to read gauges and a Moonrock steering wheel with polished spokes. 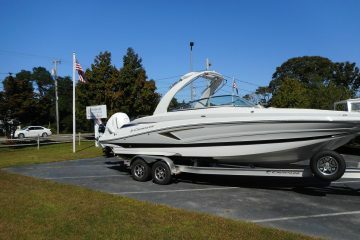 Additional include a bimini top, one piece boat cover, snap-in cockpit carpet, 5 six inch stainless steel pull up cleats, depth sounder, stainless steel windshield lock, cup holders, grab handles and rubrail with white extrusion. Also standard is the Kicker marine stereo and four speakers. Trailering is easy and the Heritage deluxe single axle trailer with a swing tongue is also STANDARD!